ID Cards, do we still need them? An ID card is the printed and physical token used to positively identify a person. An ID card can be a wonderful and easy to use tool if used correctly. This identification can be done by eye or machine reading. It’s the degree of certainty that changes and this creates the need for more features such as fraud prevention, biometric comparison and password verification, to connect the person to the card and guarantee identification. ID cards typically feature a colour photo of the users face and details of the user including name, surname and other necessary details relevant to the requirement. For school cards an ID card can be integrated into a cashless tuckshop environment and school management system to ease processes such as small payment processing and access control. The card can also carry essential information such as allergies and medical conditions which are critical in situations where quick and essential decisions need to be taken Ie. bee stings or other injuries. Most companies need to verify their own employees access into a building and those of their clients and it is often imperative that the accuracy and veracity of the data is quickly and effectively disseminated to the relevant persons. IE the card must be easy to use. For situations which often require different people to work the potential exists for fake ID’s to be used to gain access to sensitive information or other valuable products. In these environments it is important to apply easy to distinguish yet difficult to forge features such as holograms and other card printing techniques such as guilloche and micro text. An ID card is relatively easy to create and most are now printed onto PVC cards using dye sublimation desktop card printers such as SMART, Datacard, Fargo and Zebra. Card Technology Services also offers a bureau service to print photo quality cards for clients. The clients can capture the ID photos using the Android App InstantIDer free of charge. The app automatically sends us the data and we print the cards according to your requirements. 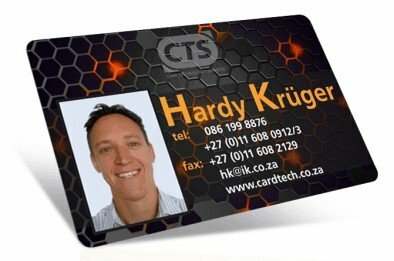 Smart cards made professionally in South Africa by us. The smart cards are printed and assembled by us. We make the cards from imported microchips from the worlds leading suppliers. We stock a wide range of the most popular chips such as Mifare 1k and 4k, EM or Omega, NFC and Temic chips. For detail information on the chips this site is an excellent source of information NXP Semiconductor (was Philips Semiconductors) and yes we use their chips. This means you may find the cheaper clones on the market but take note of security and your exposure to copyright IP liabilities. They may not be illegal in China but the original IP of NXP is valid and legal in South Africa. This protects both the manufacturer and the client. Clones and fakes although cheaper have damaged the reliability of established brand names like Mifare and NXP are committed to prevent this and so are we. If you think you may be using fake Mifare cards please ask us and we will show you how to tell the difference and let you know what chip is hidden in the card. When we discuss smart cards, we mean cards that include an either surface fitted or an embedded micro processor. This is to allow the card to perform various data related functions such as data transmission, encryption, bio metric, data storage and wallet functions. We refer to the smart cards with contact plates on the surface as “chip cards”. These are like your bank cards and GSM phone cards. For smart cards where the chip is embedded inside the core of the card we refer to them as ” RFID”, “Contactless chip” or “Proximity Cards”. There are many different types of chips, and frequencies for transmission of data, so if you’re unsure of the card you require please give us a call and we’ll be glad to assist where we can. 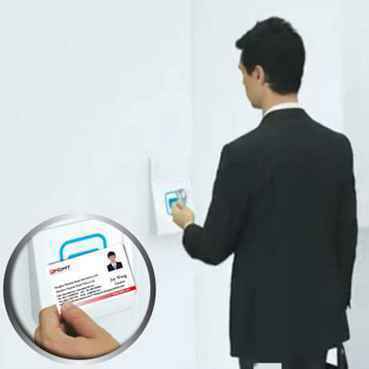 RFID smart cards use radio frequency (RF) technology to transmit data to and from a reader. Each card has a wire (coil) embedded inside the card that connects to a capacitor and microchip. The coil powers the chip via the capacitor using induction current, harnessed from the magnetic field surrounding a card reader. The same coil wire also serves at an antennae to allow transmitting and receiving of data from the device. 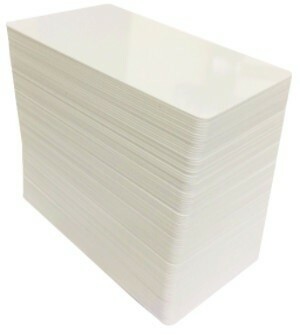 The market for these cards is growing rapidly because of the obvious benefits of ease of use, speed and versatility. Popular applications include public transport for fare payment, access control, cashless vending, parking, loyalty, electronic purse, gambling, road toll, student, employee IDs in government and corporate environments, e-passports and other secure travel documents, and cards for cashless payment. Knowing how card printers work is key to meeting your expectations by understanding the process’ limitations and real life operation. Summary: A card printer uses heat and pressure to digitally print an image into the card surface via a colour ink coated ribbon. This is how card printers work. Apart from the obvious difference of printing onto plastic instead of paper, the way a card printer works is different from your conventional desktop printer in that it uses a technology called Dye Sublimation to stain a card. This is basically a process whereby heat sensitive ink, coated to a ribbon is heated by a print head. The ink turns to a gas and under pressure this gas permeates a plastic card surface layer, in effect staining it the colour of the ink. Using different heat settings the amount of gas that stains the card is varied and this causes shades of that colour to be printed. Using additional primary colours in an additive process creates a vast range of colour that can yield excellent results in most cases. The printers also use a technique called thermal printing which melts and fuses the ink on a ribbon to the card surface by heat. This is often used in the black or “k” panel of the ribbon. Also this is the method for printing spot colour ribbons such as metallic gold and silver ribbons. In this process there are no shades of the printed artwork and is mostly used for text and graphics printing. To seal the gas and thermal printed image to the card a card printer will usually print a clear protective varnish over the card called the overlay or “o” panel. Without this panel the sublimated ink in the card surface would simply sublimate out of the card and essentially fade or vanish entirely. It is important to understand that card printers print to the surface of a card. The cleanliness and quality of the used plastic card is essential to receiving a quality print. With direct to card printing it is also important to understand that while most manufacturers claim that their printers can print “edge to edge” the reality is that you should keep a white or unprinted border around the edge of the card. 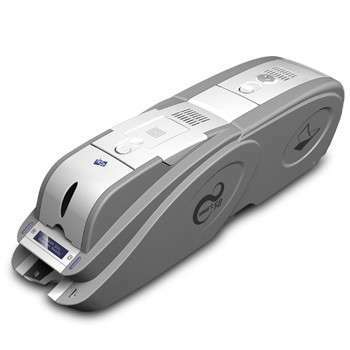 This ensures less rejects and prevents the ribbon from cutting due to the “scissor action” between the card printer head and the card edge when a heated head passes over the sharp edge of the card. While it sometimes works, I have found that it just causes long term problems. Pre-print the cards if you must have true edge to edge or use a re-transfer or indirect to card printer for “over the edge” printing.